When I try to think of an unique Japanese experience for tourists in Japan I recall, "what about travelling by train with an eki-ben!?". Japan is a very small country and if you rolled her into a ball, you could sink her in the Great Lakes of North America! So, since Japan is a small compact island, I recommend you use train travel to get around and see the great cultural attractions of Japan. From Tokyo to Osaka, it takes less than 3 hours by the Superexpress Nozomi train, part of the Shinkansen - the bullet train. The train flies like a flash to your destination and it is the best way to take in the sites, like MT. Fuji and the beautiful countryside, so, so much different from the urban sprawl of Tokyo. A popular way to eat while on the train is to have what is commonly called an "eki-ben" (eki= train station, ben= short for obento, or lunch box) . Since Japan has a long history of travel by train, nobody knows how many kinds of eki-ben we been developed in Japan! There are several types of regional eki-bens all over Japan, each make full use of the region's food specialities and unique package too. For example, the Kobe beef bento is　in Kobe. This beef is very famous worldwide and is also the source of Kobe Bryant's first name! Please check my photo album! "A Delicious Selection of EkiBen"
Are department stores better than stations to buy Eki-ben? You can't buy eki-ben anywhere except at train stations in various regions. BUT department stores and big supermarkets hold "eki-ben fairs" sometimes as special events. They are always a great success! As a matter of fact, they say ikameshi bento at Mori Station in Hokkaido is the best eki-ben sold in Japan! Yearly, they sell over 90% of their 800,000 packages at eki-ben fairs. It is 'DEPA-ben' instead of EKI-ben? Isn't it? Where Depa is part of the word 'depato' which means department store in Japanese. Okay, I would like to introduce some of the most popular and famous eki-bens in Japan. Hanagasa kokeshi bento (Yamagat prefecture Special), at 900 Yen, about $8.30 US, at the Yamagata station on the Ou Honsen Rail line. 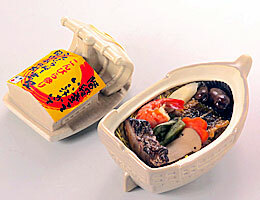 The bento container is in the shape of a kokeshi head (a Japanese wooden doll). A carefully arranged bento that includes a large prawn with shell, scallops, a chestnut, a shiitake mushroom, burdock and edible mountain plants on top of rice. Masu no sushi bento (Toyama city Special), at 1,100 Yen, about $10.20 US, at the Toyama station on the Hokuriku Honsen Rail line. Pink trout is spread on Koshihikari sushi rice made in Toyama, then tightly-pressed and wrapped in bamboo leafs all enclosed in a round container. Toyama has high mountain, it means their water is very clean and tasty. In those place rice, sushi are so delicios too. Matsusaka-gyuu Mootaro bento (Mie Matsusaka city Special ), at 1,260 Yen, about $11.70 US, at the Matsuzaka station on the Kise Honsen Rail line. This is a really high-tech bento. When you lift off the cow faced lid ,off the container, the melody of Furusato is heard (a nostalgic song that everyone knows in Japan, meaning hometown), Sukiyaki flavoured Matsusaka-beef (a grade beef, well-known like Kobe-beef) is placed on top rice. Kobe Gyumeshi bento (Hyogo Kobe city Special ), at 1,000 Yen, about $9.30 US, at the Kobe station on the Tokaido Honsen Rail line. As you probably have already guessed, this bento contains Kobe-beef sukiyak. Seto no kaki-meshi bento (Hiroshima Hiroshima city Special ), at 1,000 Yen, about $9.30 US at the Hiroshima station on the Sanin Honsen Rail line. Delicious boiled oysters flavoured in soy sauce on top of an additional oyster and rice fusion. Konpira mairi bento (Kagawa Takamatsu city Special ), at 1,050 Yen, about $9.90 US at the Takamatsu station on the Yosan Rail line. A ceramic container containing a miniature Konpira Shrine warship is used for this eki-ben. Teriyaki sea bream and teriyaki conger eel are layered on top of a sea bream rice mixture. Kurimeshi bento, at 892 Yen, about $8.20 US, at Hitoyoshi station on the Hisatsu Rail line. Shredded daikon radish is spread on a bed of soy sauce rice in a red chestnut shape container. Edible mountain plants, several sweetened chestnuts and veggies cooked in broth make up this bento. Wicket To Ekiben(JP),　kishatabi ha tanoshiku(JP). This is a nice Ekiben Blog (JP)　and you can see various package Ekiben here.